Remember these guys? Fiberoptic lamps that kind of looked like Andy Warhol's hair? Oh, did we love them. Touching them, bending them, letting them swing back into place. As far as we were concerned, ALL lamps should look like this. When I saw "Avatar" and the Tree of Souls on Pandora, I thought it looked like one big giant fiberoptic lamps. A close cousin of the fiberoptic lamp was that 1970s fave, the dripping oil lamp. Someone actually thought it would be a good idea to have a lamp where some kind of oil ran down strands of wire and made drips, and perennially recycled itself. Apparently these were called Rain Lamps, and the one at the top of this page, the bathing woman inside the shower of oily rain, is the one I remember most vividly. We didn't have it, but someone we knew did, and I was drawn to it like moths to flame. 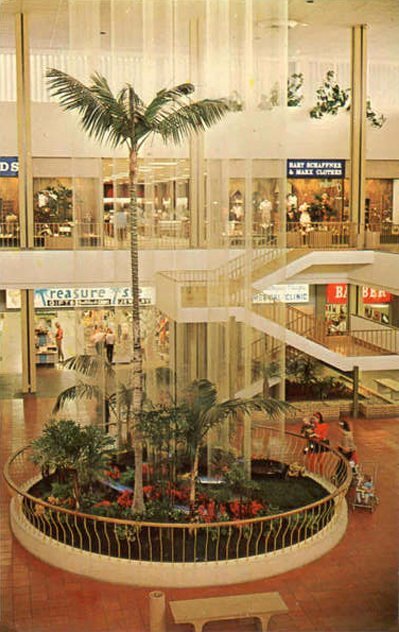 Gael's husband, Rob, grew up in Southern California, and his home mall, Topanga Plaza, had a giant version of this kind of thing. Here's an old postcard showing it. 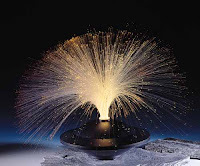 Do you remember fiberoptic and rain/oil lamps? My grandma had a rain lamp. I thought it was so neat. I always thought my friends who had fiber optic lamps were rich! I wanted one so badly. I ALWAYS wanted one of those huge, rotating fiber optic lamps that changed colors. The closest I ever came was a fiber optic tree kit, with the strands of fiber optic and brown florists tape to mold into a tree with the fibers sticking out. It was stupid, and I didn't have the patience. THREE! I have no idea what happened to them.